1918-1922: Schriftsteller und Journalist in Wien. After his war services, Hans moved to Vienna (moved back to Vienna ? ), where he lived as a freelance journalist, publishing articles in many newspapers in Vienna and Budapest. He also wrote poems which were published in several anthologies and newspapers. [He] became prominent especially through socially critical courtroom reporting: reported several spectacular cases in the interest of preventing or reversing miscarriages of justice. Contibutor to Berliner Tageblatt, Frankfurter Zeitung, Die Weltbühne and others. It was due to his work that the severe penalties for abortion were reduced. Margulies hat sich nach einigen Jahren als Gerichtsberichterstatter einen guten Namen gemacht. Er hat einen rühmenswerten Anteil gehabt an der Revision des Urteils im skandalösen Vatermord-Prozeß in Tirol gegen den später berühmt gewordenen Photographen Halsmann. Halsmann was accused of murdering his father. Many believed he was wrongly imprisoned and Hans was influential in having him released. PH is now (1960) a famous photographer in New York. As a court reporter who was also interested in photography, he made (had made ?) a briefcase with a built-in camera. In this way he could smuggle his camera into the courtrooms and take illicit pictures. 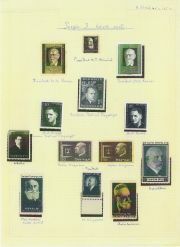 He was an expert, well known philatelist. Alongside all of this were the contributions to leading german newspapers, e.g. the Berliner Tageblatt, Frankfurter Zeitung, Dortmunder Generalanzeiger, Prager Presse, Prager Tageblatt, und die Weltbühne, Berlin. I was also the viennese representative for the Frankfurter Illustrierte Zeitung, for which I produced many large photo reports. Furthermore: Dr. Stefan Zweig, Arnold Höllriegel, Rudolf Olden, Dr. Arthur Rundt, Leopold Schwarzschild, Berthold Viertel, Theodor Wolf, Robert Neumann, Benno Reiffenberg, Joseph Roth, Hermann Broch. His mention of Joseph Roth is interesting, in view of the (possible) engagement to Freiderike Reichel in the early 1920's. See : Engaged, but ... .
"in 1922-23, she designed the interior of an apartment for the writer Hans Margulies ..."